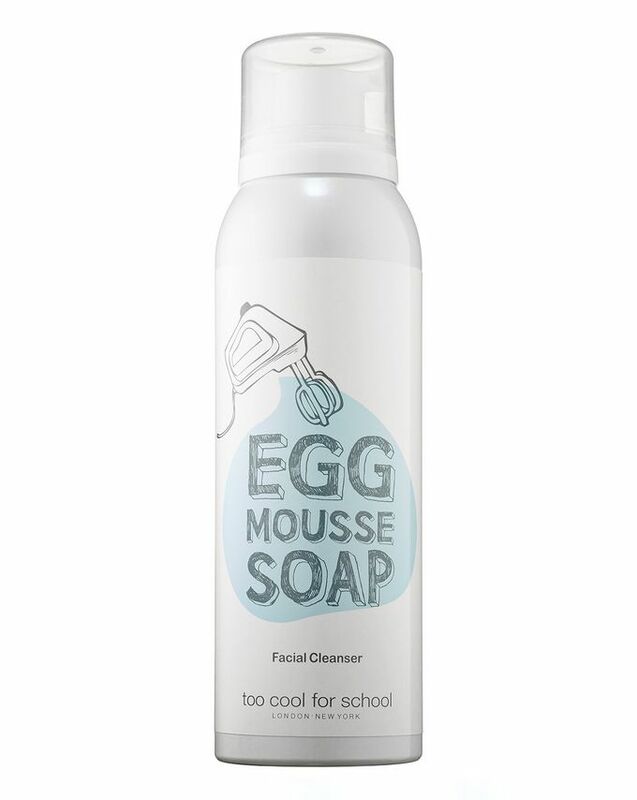 Wonderfully whipped and light as air, this mousse cleanser is infused with egg, milk proteins and amino acids to gently hydrate, purify and replenish skin. Very fine cleansing particles are able to get deep into skin, dissolving oils and dead skin cells and nourishing for long-lasting smoothness and hydration. Your complexion will be left thoroughly clean, moisturised and glowing. Too Cool for School, the Korean brand that’s clever as well as cool, brings you the latest skin care trends wrapped up in super-cute, playful packaging. Like washing your face with beautifully airy meringue, Too Cool For School’s Egg Mousse Soap is a clever cleanser that combines milk proteins, amino acids and all-important egg extracts to purify and nourish skin. Ultra-fine particles of the skin-loving ingredients penetrate the complexion deeply, dissolving oil and dead, dulling cells while tightening pores and balancing oil for a renewed, replenished appearance. Utilising both elements of the egg, egg white extract purifies, tightens and brightens, while yolk extract imparts much-needed moisture to leave skin hydrated and glowing. Hold the can upright and, pressing softly, dispense an egg-sized amount into hands. Massage gently over face and rinse thoroughly with water. Tip: can be used as a shaving cream. Used this for the first time this evening. I bought it as I am a big fan of Korean beauty and wanted to try something new. The mousse is very soft on my skin it felt like silk and cleaned my face well after my mask. Afterwards, there was no tightness and my skin felt clean and smooth. I’ve rated this 5 stars but obviously, I will see how it performs in the long run. For now, I am very satisfied and eager to try other products from this range.